Governor Andrew M. Cuomo today announced that New York State has provided over $20 million to areas affected by Superstorm Sandy for the reimbursement of costs for cleaning up after the storm. Albany, NY - May 15, 2013 - Governor Andrew M. Cuomo today announced that New York State has provided over $20 million to areas affected by Superstorm Sandy for the reimbursement of costs for cleaning up after the storm. The localities receiving these FEMA-approved funds include: the Village of Freeport, Nassau County; Village of Westbury, Nassau County; Town of Oyster Bay, Nassau County; Suffolk County Department of Health; Westchester County; City of Yonkers, Westchester County; and the New York City Department of Transportation. “Restoring communities damaged by Superstorm Sandy is our agency’s highest priority and these Public Assistance reimbursement funds will help each of the affected communities rebuild faster and stronger,” said NYS Division of Homeland Security and Emergency Services Commisioner Jerome M. Hauer. The release of these federal funds are part of ongoing and anticipated future reimbursements the state will administer and pay to the affected municipalities. Municipalities are being reimbursed based on a variety of projects that include construction and demolition, sand and vegetative debris removal, EOC activations, evacuations, inspections and emergency IT repairs and restoration and the Sheltering and Temporary Essential Power (STEP) program. The state will continue to make these reimbursement payments as FEMA obligates the funds. The Village of Freeport, Nassau County, is receiving $1,835,311 for reimbursement of costs incurred by the village following the impact of Superstorm Sandy. The Village of Freeport suffered from rushing flood waters, heavy rain and winds, inundating over 40 percent of the Village including over 4,000 homes, businesses, and critical infrastructure facilities (e.g., power plants, storm drains, etc. ), which were flooded to depths up to 8 feet. Right of way debris was identified following Sandy’s storm surge and landfall. Water borne storm debris, consisting of trees, limbs, flood-damaged furniture and white goods, vehicles and debris from damaged or destroyed buildings was scattered throughout Freeport including 53,389 cubic yards of mixed construction and demolition and vegetative debris. In many areas, the debris blocked emergency access points and created a significant risk to health and human safety, requiring the Village to react expeditiously in removing this threat from largely residential communities and from various right of ways. The Village estimated that 18.6 miles of previously flooded storm drains, 738 catch basins, and 365 manholes will need to be cleared of storm debris to resolve the flood hazard. Costs consisted of municipal labor, equipment, material, ranted equipment and contract services. The Village of Westbury, Nassau County, is receiving $463,603 for reimbursement of costs incurred by the village following the impact of Superstorm Sandy. Heavy winds and rain from Sandy damaged trees, limbs and branches causing an accumulation of approximately 8,886 cubic yards of woody debris on roadways, pedestrian walkways, parking lots, and other properties. The Village used municipal labor, equipment and materials, as well as private contractors and Nassau County to collect, remove and dispose of the debris. 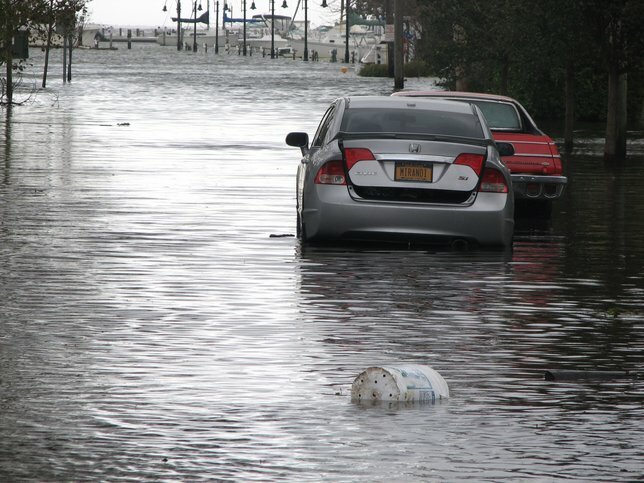 The Town of Oyster Bay, Nassau County, is receiving $13,143,778 for reimbursement of costs incurred by the town following the impact of Superstorm Sandy. Strong winds and heavy rains produced overland flooding and storm surges from Sandy, which brought down trees, limbs, power lines, and destroyed road drainage facilities and buildings throughout Nassau County. Roads were blocked with debris and downed power lines causing hazardous conditions throughout the area. The storm inundated residential and commercial areas throughout Oyster Bay depositing an estimated 101,506 tons of construction and demolition debris. The Town used municipal labor, equipment and private contractors to respond to the emergency. The Suffolk County Department of Health is receiving $387,792 for reimbursement of costs incurred by the county following the impact of Superstorm Sandy. High winds, heavy rain and localized flooding from Sandy created a public health threat to the residents of Suffolk County. Flooding conditions caused an immediate threat to lives, public health and safety to include power outage, water contamination, loss of emergency services and critical medical facilities. The Suffolk Health Department was tasked to provide emergency protective services to Suffolk County residents as vaccines and other medicinal supplies were destroyed due to lost power which caused the loss of refrigeration. Public Health Protection task forces were implemented to provide protective measures throughout the County such as Food Control Units to prevent foodborne illness, Environmental Quality Health ensured safe drinking water, appropriate sewage treatment and disposal of toxic/hazardous waste and Mental Health and Hygiene units preformed vaccination and quarantine quality assessments on personnel. Westchester County is receiving $1,920,095 for reimbursement of costs incurred following the impact of Superstorm Sandy. As a direct result of the high sustained winds and precipitation, approximately 39,580 cubic yards of vegetative debris hazards including numerous large downed trees and uprooted stumps and 6,300 cubic yards of sedimentary debris hazards including sand, dirt, and gravel were deposited on public property in and along roads, parks, and rights-of-way throughout the County. In addition, 2,378 tons of mixed disaster debris classified as Municipal Solid Waste and 40,314 tons of vegetative disaster debris classified as Organic Yard Waste was received by the Westchester County Department of Environmental Facilities. In order to eliminate the immediate threat to public health/safety and property, emergency work by the County was necessary to remove the hazards posed by all the debris. Westchester County utilized municipal labor and equipment resources and private contractors to remove the debris. The City of Yonkers, Westchester County, is receiving $1,649,816 for reimbursement of costs incurred by the city following the impact of Superstorm Sandy. As a direct result of the high sustained winds and precipitation, approximately 7,659 tons of hazardous vegetative debris was deposited in roads, parks, and rights-of-way throughout the City. In order to eliminate the threat to public health and safety, emergency work was necessary to remove the hazardous vegetative debris including numerous large downed trees and brush. The City utilized municipal labor and equipment as well as private contractors to remove the debris. The New York City Department of Transportation is receiving $773,041 for reimbursement of costs incurred by the department following the impact of Superstorm Sandy. Strong winds, heavy rains and storm surge due to Hurricane Sandy caused extensive damage throughout the New York City, including the accumulation of debris on streets, sidewalks, and other public facilities. The debris composed of woody materials, sand, stones, street and building/household wreckage, and objects of all kinds deposited by the storm surge and wind, impeded vehicular right-of-ways and posed an immediate threat to the public’s health and safety. NYC DOT worked with the Department of Sanitation New York (DSNY) with their city-wide debris removal of an estimated 1,300,000 cubic yards of debris. Crews also supported NYC Parks and Recreation in collecting and hauling debris from City parks. DOT and Parks crews removed downed trees and limbs both on the arterial highways and street network. Subject: LongIsland.com - Your Name sent you Article details of "Governor Cuomo Directs Over $20 Million in Federal Funds to Reimburse Localities for Superstorm Sandy Clean-Up Costs"